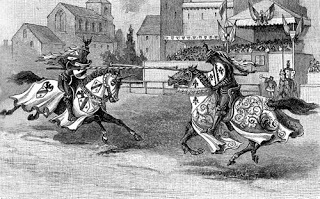 Then the duke set forward and charged with his spear, and the king likewise unadvisedly set off towards the duke. The people, seeing the king's face bare, cried hold, hold; the duke neither saw nor heard, and whether the king remembered his visor was up or not few could tell. Alas, what sorrow was it to the people when they saw the splinters of duke's spear strike the king's headpiece. For most certainly the duke struck the king on the brow right under the guard of the headpiece on the very skull cap or basinet piece to which the barbette is hinged for strength and safety, which skull cap or basinet no armorer takes heed of, for it is always covered by the visor, barbette and volant piece, and thus that piece is so protected that it takes no weight. But when the spear landed on that place there was great danger of death since the face was bare, for the duke's spear broke into splinters and pushed the king's visor or barbette so far back with the counter blow that all the King's head piece was full of splinters. The armorers were much blamed for this, and so was the lord marquise for delivering the spear blow when his face was open, but the king said that no one was to blame but himself, for he intended to have saved himself and his sight.